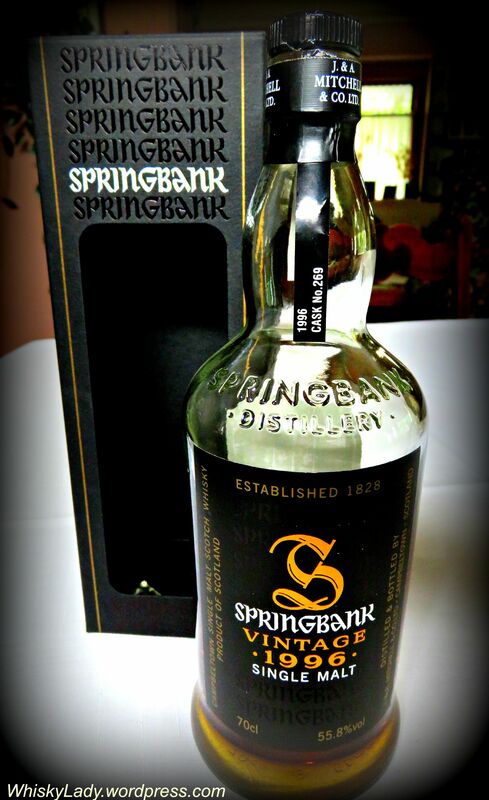 Springbank is a family owned distillery in Campbeltown. So far, I’ve had good experiences with whiskies from these folks. A few years ago we sampled the delightful Springbank 18 year, paired with desert. And long before I even imagined recording tasting notes, a Longrow had a most enjoyable peaty time in my whisky cabinet til the last drop was polished off! During my last trip to Singapore, I enjoyed their Hazelburn 12 year and was sorely tempted to pick up the Hazelburn 8 year 1st bottling. Overall – Bold and beautiful! This is no light spring dance or sunny summer romp, instead this whisky is bursting with the golden hues and blazing fire of autumn. In short – I want more! Unfortunately I do not know what year this was bottled, however there enough going on here to warrant paying attention, regardless of age. This entry was posted in Campbeltown, Scotland and tagged #WhiskyLady, #WhiskyWomen, Campbeltown, Springbank, Springbank Vintage 1996 by Carissa Hickling. Bookmark the permalink. I’m a huge fan of Campbeltown whiskies for some reason and I count Longrow as one of my top rated spirits. Of course it was Springbank that put me on that road in the first place. Your particular expression was bottled in 2009 which would make it between 12 or 13 years of age. They could have just mentioned that on the bottle, right? Thanks for identifying the age… not having the bottle in front of me meant was a little short on the normal label details. For years, Longrow was a staple whisky – as soon as my last bottle was finishing I would be sure to pick up a replacement. That was pre-tasting notes time and also when I was traveling internationally at least twice a month so had plenty of opportunities to re-stock. Alas these days my travels are much less so I’m far more selective plus seeking something new for our tasting group rather than think of my personal stash.